The early reporting supports these comments. “Google Hire could represent competition for companies like Greenhouse, Indeed, Jobvite, LinkedIn, and Oracle’s Taleo” proclaimed a report by VentureBeat. The new offering is speculated to be coming from Google’s enterprise cloud services division, which was jumpstarted by Google’s acquisition of Bebop two years ago. Bebop’s CEO Diane Greene now heads the enterprise cloud services division at Google. CEO Diane Greene previously co-founded VMWare. Google acquired Bebop for $380 million. Google also has a resume builder solution on the withgoogle.com domain. 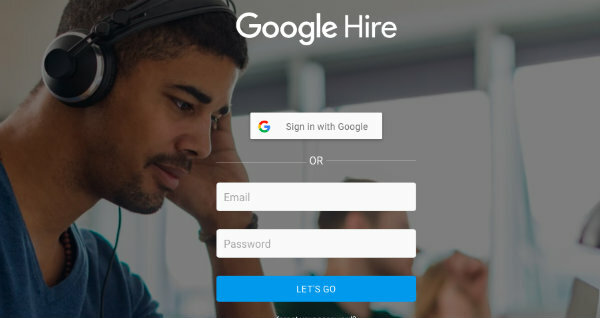 Companies currently using Google Hire include Medisas, Poynt, DramaFever, SingleHop, CoreOS, Nanz, Touchlab, Calendly, Citizen Inc, Pace Avenue. Here’s an example of a job posting. Nothing near a Fortune 500 here, but it should just be a matter of time. The move to launch Google Hire comes on the heels of its Cloud Jobs API product that was introduced in 2016. The release sparked speculation that Google was potentially laying the groundwork to launch a job board. Initial testers included CareerBuilder, Dice and Jibe. Reviews of the API were positive. This isn’t Google’s first time at the job board party. The company launched Google Base in the mid-2000s to much fanfare. The service allowed anyone to upload job content into Google to then be accessible by their search engine. They even separated those results from main search results. I can remember Google even attending and exhibiting at industry tradeshows to stir-up attention. The experiment failed, but they’ve probably learned a thing or two since then. For example, B2B is probably a more profitable road than throwing more spam into their search index. Facebook launching a job posting component and Microsoft buying LinkedIn only support the move to get serious about employment. The failure of legacy applicant tracking systems is an opening for bigger players. Much of this is speculation right now, however. We don’t yet know if this is going to be a full-fledged job board or Google’s foray into the ATS space. If it is an ATS, Google could do worse than simply repurposing their own applicant tracking solution, which is incredibly easy and, well, Google-y. “At this point, it’s unclear what the current state and future of Google Hire is,” said Jason Rowley in a post on Crunchbase. “Apart from the list of companies above, which Crunchbase News identified through exhaustive searches using Google and Twitter, we don’t know how many companies are piloting the software. My guess is Google will go full court press to get as many companies using this product as possible, replacing their current applicant tracking system and career site. Once they’ve established a foothold on the corporate site, they can start adding in messaging, video conferencing, Docs and all-things-Google. More speculation by yours truly, job postings will start showing up in Google search results and companies will be able to easily boost job postings without even knowing what AdWords is. Companies who use Google Hire will be able to finally appreciate what every job site and HR tech vendor already knows: Traffic generated by Google – both paid and free – is a beautiful thing. I also wouldn’t underestimate the influence of Indeed, which sold for a rumored $1.6 billion in 2012. Indeed, who once referred to itself as “Google for jobs” benefits greatly from Google search traffic, both organic and paid. There’s a good chance the brainiacs at Google started crunching numbers and realized there were worse places to be than employment. Moonshots are fun, but rarely pay the bills.